The breed is currently being upgraded in New Zealand from Standard (Black) Galloway cattle (see » Grading Up Programmes). The colour pattern of the White Galloway – a silvery white coat with black, red or dun points (ears, eyes, nose, and lower legs) – is an ancient one and was originally distinctive of the Wild White cattle of Britain. 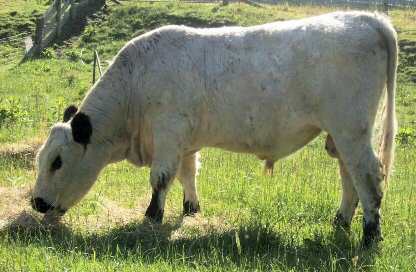 These are typified by the surviving British White, Chillingham and White Park herds. The herd of White Park cattle at Cadzow Park, Hamilton (adjacent to Galloway) is believed to be the source of the special colouring of the White Galloway.